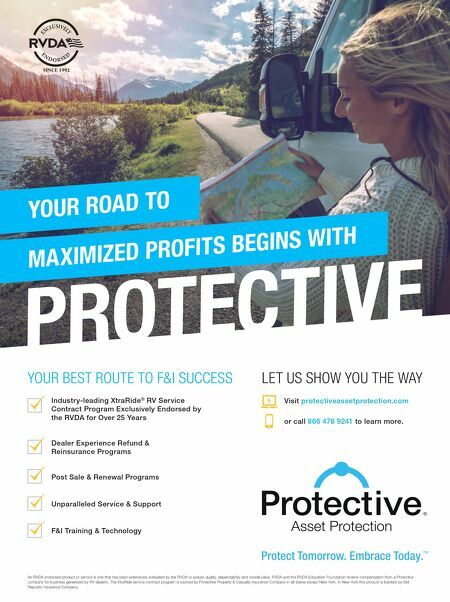 124 • RV PRO • March 2019 rv-pro.com Distributor Show Coverage A F T E R M A R K E T Kuma Pop-Up Gazebo A swarm of buzzing mosquitoes can easily kill the buzz of camping in the mountains. There's an allotted window of exposure to the elements as the RV is unpacked and the kids run around. That's where Canadian supplier Kuma Outdoor Gear comes into play with its latest edition: a lightweight, six- panel gazebo that unfolds, ready-to-go, in seconds. The origami-inspired gazebo has no removeable parts and requires no pre-assembly for the fiberglass poles, meaning that it's ready right outside of the included carrying bag. Made with ripstop nylon and mesh, Kuma's gazebo is water-resistant and can comfortably fit six people. Free-standing, the gazebo's skirt can be pegged down or weighted with sandbags. In terms of accessories, there are additional privacy panels that can drape over the mesh windows, as well as a matching floor panel for total enclosure and UV protection. However, RVers typically throw down a floor mat, says Kuma Co-founder Manabu Saito. Saito speaks from experience. An avid outdoorsman himself, he spends the summers in his Roadtrek Class B customized to look like a rally vehicle, and takes the winters to go skiing and snowboarding. "Everything we do, we base on our experiences in camping," Saito says. The concept for the gazebo, he says, came while camping in the Canadian Rockies in Jasper National Park as mosquitoes bombarded him. "We wanted something that people can put up really quickly," he says. Even the idea for the company Kuma was born in Jasper around a campfire about three years ago. Originally, Saito and his partner worked for Woods and Outbound until Canadian Tire acquired it. In that transition, all the independent suppliers for the Woods and Outbound brand needed somewhere to go. A big part of the tents, cots, and camping chair market was missing, Saito says. "So, we jumped on it right away," he says. "We thought it was an opportunity." 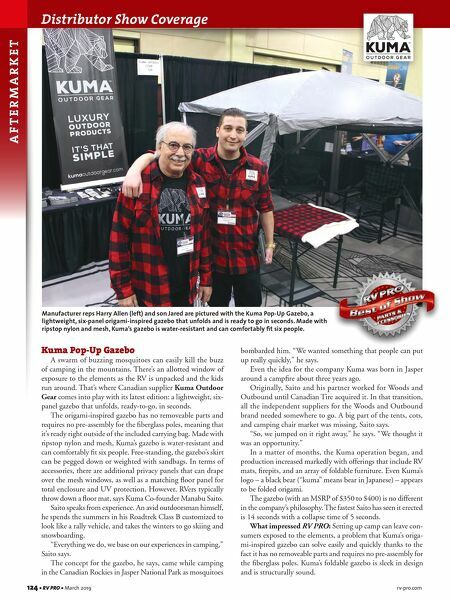 In a matter of months, the Kuma operation began, and production increased markedly with offerings that include RV mats, firepits, and an array of foldable furniture. Even Kuma's logo – a black bear ("kuma" means bear in Japanese) – appears to be folded origami. The gazebo (with an MSRP of $350 to $400) is no different in the company's philosophy. The fastest Saito has seen it erected is 14 seconds with a collapse time of 5 seconds. What impressed RV PRO: Setting up camp can leave con- sumers exposed to the elements, a problem that Kuma's origa- mi-inspired gazebo can solve easily and quickly thanks to the fact it has no removeable parts and requires no pre-assembly for the fiberglass poles. Kuma's foldable gazebo is sleek in design and is structurally sound. Manufacturer reps Harry Allen (left) and son Jared are pictured with the Kuma Pop-Up Gazebo, a lightweight, six-panel origami-inspired gazebo that unfolds and is ready to go in seconds. Made with ripstop nylon and mesh, Kuma's gazebo is water-resistant and can comfortably fit six people.